HR companies hiring on behalf of their tourism clients should register as Other. Training institutions looking to submit career events should register as Other. Companies such as retirement and community residences or work camps that operate outside of the tourism sectors, cannot post their hospitality positions on the go2HR Job Board. Third-party suppliers that service tourism businesses, such as software companies, laundry services, consultants and brokers, cannot post their job openings on the go2HR Job Board. Companies such as stand-alone retail operations, institutions, fitness and wellness centres, real estate services, and property management firms for private residences are not considered tourism. go2HR reserves the right to deny registration to companies that do not qualify, based on these guidelines. Declined company registrations will be removed from the website and associated user account(s) will remain on the system without job board usage rights. Your subscription to go2HR’s newsletter(s), if applicable, remains active; you can unsubscribe from these emails at any time. Registered companies must provide a description of their operations and specify which region they are located in: Vancouver, Coast and Mountains, Vancouver Island, Northern BC, Thompson Okanagan, Cariboo Chilcotin Coast or Kootenay Rockies. If Headquarters is located outside of British Columbia, employers may select “Outside BC” as their primary location; however, employers cannot post jobs that are located outside of BC. Employers may register multiple addresses under one company profile if they have different locations. These locations must be in BC. All relevant sectors must be selected for each company. For example, a hotel could select both Accommodations and Food & Beverage Services. This will ensure that all opportunities will appear in the search results accordingly. All postings must include company name and location. No anonymous postings permitted. An employer may have an unlimited amount of jobs at one time. However, there may only be one job posting per position (no duplicates). The employer must identify a proper job title, description, and application process for every job posted. The job title must match the job description. All positions posted must be paid jobs (no volunteer positions). All jobs will be automatically posted on the job board once the employer submits the job. Job postings will be published exactly as submitted. Employers are encouraged to double-check postings to ensure correct grammar, formatting, spelling, etc. Employers may edit or revise their posted positions at any time; however, the job posting will remain on the job board in the same position as it was originally posted. All job postings will automatically expire 30 days from the original posted date. To re-post an expired posting, employers must “Duplicate” from an existing posting. Employers may remove their job posts prior to 30 days if the position is filled early. If a position remains unfilled after 30 days, employers may extend the position for another 30 day period. Job postings and candidate qualifications must comply with BC employment legislation. Example: Must not discriminate based on any of the protected grounds, or violate Employment Standards Act, Labour Relations Code, Human Rights Code, or the Personal Information Protection Act. go2HR reserves the right to review all job postings and remove any that we deem inappropriate or in violation of any relevant provincial/federal statute or legislation. All positions posted must be located at a tourism operation, as defined under “Company/Organization”. The Apply Now field must include a valid email address or website URL that will redirect job seekers to apply directly through the employer’s website. If employers do not have a careers website or email address, enter “N/A” in the Apply Now field and alternate application instructions are to be provided in the Application Process box. The Application Process box may be left blank if there are no further instructions beyond clicking the Apply Now button. For any questions regarding using the job board, contact us jobs@go2hr.ca. Q. How much does it cost to post on the go2HR job board? A. It is free for all tourism and hospitality employers operating in British Columbia. Q. When will my jobs be approved and posted? Q. My job was removed. Why did this happen? A. Your job may have been removed because it did not follow our go2HR job board policies. If you have any further questions, please contact us. Q. I have more than one opening for the same job. Do I have to post it twice? A. No! You can now let employees know you are hiring more than one opening by filling out the “Number of Positions” box. Q. How long will my job be active for? A. All jobs will be active for 30 days. If you wish to remove the job before so, you may by going into the position and making it inactive. A. You may reach us at jobs@go2hr.ca or at 604 633 9787 ext 231. There are six main parts to an effective job posting: title, company information, job description, qualifications, compensation/benefits, and application process. The job posting should overall be warm and inviting, and walk a fine balance between having enough information where the applicant knows what your company and the position is about, but excludes unnecessary information to avoid being overwhelming and bogged down. 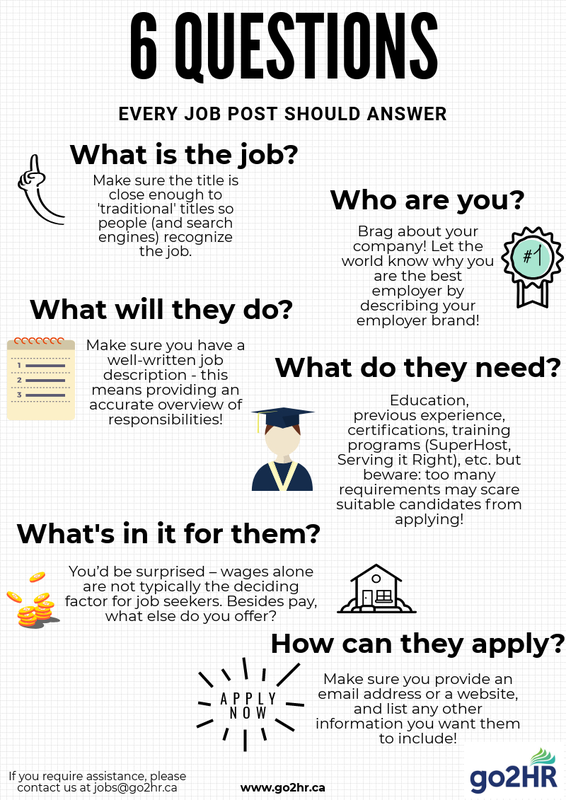 Here are some tips on how to approach each of these critical segments of a job posting. Position Title – What is the Job? Company Information – Who are You? The opening segment to a job posting is all about your company. It should be well written, and highlight what your organization does, reference the location/property, the company culture, and include whatever makes you unique. Take pride in your organization! You may want to include prestigious awards or accolades, describe the beautiful location in which you are situated, and highlight your great company culture. This will be the first impression of your organization that an applicant gets, and is a great opportunity to draw them in. Once you have perfected this section, you can use it for every job posting you have to ensure consistency and quality of future postings. Job Description – What Will They Do? This is the “meat and bones” of any job posting. In this section, you will want to write as much information about the role as possible, without turning it into a novel. Aim for 7 – 12 bullet points: If the role is very basic, then fewer descriptors are needed; if it is more senior, you should elaborate further. The job seeker should be able to have a good understanding of the position and what it entails, and they should be able to self-assess whether this is a good fit for them or not. Be honest: if the role includes less desirable duties, make sure you include them! Always use positive language and be as specific as possible about the role, without making it too wordy. Qualifications – What do They Need? Compensation/Benefits – What Will They Get? Application Process – How Can They Apply? Good news: you have piqued the applicant’s interest and they want to apply! Ensure you have a careers email address where they can send their resume to, or you can direct them to your careers website. On the go2HR job board, we have a spot for you to fill in your email or website, which generates into an external link for easy application. As the new go2HR job board will support automatic publishing of jobs, there will be no editing or manual intervention from the go2HR team. Here is our guide to building an effective job post. Are you not receiving as many applicants as you would like to be? Consider revamping your job posting! Here is the key information every job posting must have to build the best job posting possible.